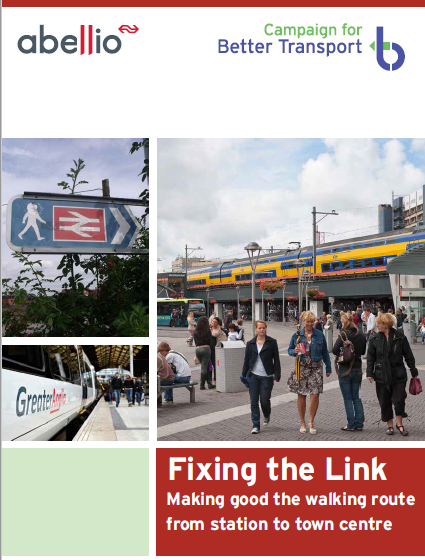 In 2013 the “Campaign for Better Transport” undertook some research, funded by Abellio about the importance of good walking routes from stations to town centres and how they could be improved using the ‘Fixing the Link’ methodology pioneered by Dutch Railways. Three towns in England (Colchester, Ely and Ipswich) were scored using these criteria and compared to similar towns in the Netherlands. The Dutch cities scored much better across the board, with English railway stations being generally located much further outside town centres and pedestrians having a low priority compared to other traffic. The research identifies some of the causes of the low scores and makes suggestions for how things could be improved. Is this methodology being applied to other towns and cities in the UK? Perhaps a variation on this “Fixing the Link” methodology could be adapted for rural railway stations to increase access opportunities for increasing visitor numbers to rural attractions without cars? It would need to include an appraisal of “fixing the last mile” – integrated interchanges linking to various types of bus services.